On Monday, October 1, 2018, Yucaipa Sheriff’s Station investigated a report of sexual abuse on two minors. The victims identified the suspect as Jose Isabel Martinez. Throughout the course of the investigation, it was determined Martinez was a sixth-grade teacher at Frisbie Middle School in Rialto, CA. The identified victims are acquainted with Martinez, but not his students. The Sheriff’s Department Crimes Against Children Detail assumed the investigation and discovered Martinez sexually assaulted two victims, numerous times, over the course of a few years. On Tuesday, January 8, 2019, Martinez was arrested for PC 288.5(a), Continuous sexual abuse to a minor. He was booked at West Valley Detention Center in Rancho Cucamonga and bail is set at $700,000. 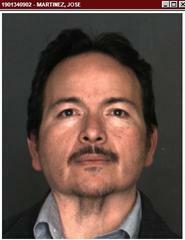 Detectives believe there may be additional victims and are releasing Martinez’ booking photograph. Anyone with information is urged to contact the Specialized Investigation Division, Crimes Against Children Detail, Detective J. Melrose (909) 387-3615. Callers wishing to remain anonymous are urged to call the We-Tip Hotline at 1-800-78-CRIME (27463).